It's hard to predict who will be more delighted by "Lyonel Feininger: At the Edge of the World," now on view at the Whitney Museum of American Art: Feininger's small coterie of ardent fans or the vast majority of the public who have never heard of him. To both groups, however, the exhibition—Feininger's first solo museum show in the U.S. in decades—should be a revelation. Aside from displaying the full panoply of his paintings, it brings together for the first time his pioneering comic strips and caricatures, woodcuts, photographs, and hand-carved, painted wooden figures and buildings—toy sculptures forming a village that came to be known as "The City at the Edge of the World." When he died 55 years ago, Feininger was heralded as a pioneer of American modernism. Alfred H. Barr Jr., the first director of the Museum of Modern Art, had included him in its second exhibition, "Paintings by 19 Living Americans," in 1929, and he eulogized Feininger at his funeral in 1956. But even by then, critics like Clement Greenberg were promoting Abstract Expressionism over figurative modernism, and Feininger began his fadeout. Add to this the 20th century's anti-German sentiment and confusion about Feininger's nationality: He was born in New York to a German father and a German-American mother but sent to Germany to study music at age 16. There, he switched to art, married (twice) and had children. He exhibited with Der Blaue Reiter and Die Brücke groups, and taught at the Bauhaus. Despite his yearnings for his home country, family and success caused Feininger to stay in Germany until the Nazi assault on modernist art forced him to flee in 1937, with $2 in his pocket. A month before he turned 66, Feininger started all over again in the U.S. The exhibition, curated by Barbara Haskell with Sasha Nicholas, introduces Feininger with his early paintings; they are figurative, whimsical, often humorous depictions of life in German villages in the early 1900s, rendered in brilliant, often unnatural colors. But as, say, "Carnival in Arcueil" from 1911 shows, things are not exactly right. The pied-piper-like character towers over those around him, some of whom are following, while others flee. This picture, along with others in this gallery, harks back to Feininger's work as an illustrator, samples of which are on view in an adjacent room. Especially noteworthy—and charming—are the cartoons he developed for the Chicago Sunday Tribune, "The Kin-der-Kids" and "Wee Willie Winkie's World." In them, Feininger turns everything into animate objects—trees that run, trains that see, houses whose dormer windows yawn. 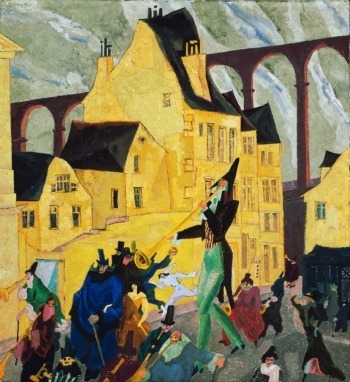 The yellow houses in "Carnival" are just a few steps away from these beginnings, and in the paintings that follow, Feininger's style grows more distinctive and more experimental. He plays with scale relationships, depicts a scene from multiple vantage points, flattens forms and otherwise distorts reality. This progression is easily seen in "Green Bridge II," from 1916, a more complicated version of a work he painted in 1909. In both, a mint-green bridge frames people walking along a village street, some in work clothes, some dressed up for the evening. But in the second version, the bridge is faceted, the light more luminous, the contrasts starker and the figures tubular, not angular. It's both more beautiful and perhaps more ominous. 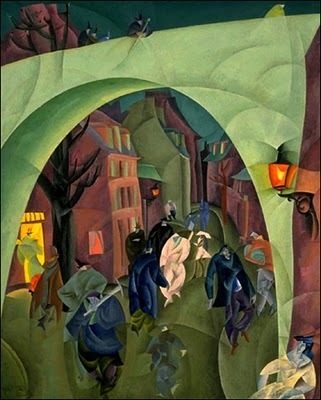 Feininger had visited Paris, where his exposure to Cubism had sparked his imagination. But he never adopted Cubism's radical fragmentation of form. Even in his more abstract works, like "The Side-wheeler II," from 1913, everything is easily recognizable. After World War I, Feininger joined the faculty of the Bauhaus, a school that aimed to fuse fine art, craft and architecture, and his work took a turn. His paintings become more architectural, more spare, using overlapping planes. They center on a simple image of, say, a church or a ship, almost as if viewed through a prism. His use of light is ethereal: It streams brilliantly through works like "Church of the Minorites II" from 1926, "X-54 (Sailboats)" from 1929, and "Sunset at Deep" from 1930. These works demonstrate his desire to show the spiritual nature of the world. During these years, Feininger also took up photography, using lighting effects to produce lovely atmospheric works. Once he left Europe and settled in Manhattan, Feininger's works grew sparer still, though more fluid—images of his new city rendered in a looser style, minus the depth. These late works never achieve the greatness of those he made in Europe, however. Even the paintings recalling his beloved time on the Baltic Sea coast, where in earlier days he made calm, quiet paintings of sailing ships, fail to rise to those heights. Throughout the exhibition and in her extensively researched catalog, Ms. Haskell presents Feininger as experiencing a constant duality, starting with the tug between his native country and his adopted one, between U.S. optimism and ingenuity and Germany's respect for learning and tradition. He was torn, too, by his facility in both commercial and fine art, in both music (three fugues he composed during the 1920s will be performed at Carnegie Hall next fall) and visual art. Most deeply, perhaps, he oscillated between human and divine concerns in a secular world, and he strived in his art to express the "glory there is in Creation." As troubling as those dualities may have been to Feininger, they seem to have fueled his lifelong creative quest. In Germany, Feininger is not only known and shown regularly, but loved. In 2002, a stamp was created in his honor, depicting one of his church paintings. With the Whitney exhibition as evidence, one hopes, he is on his way to long overdue recognition in his native land.